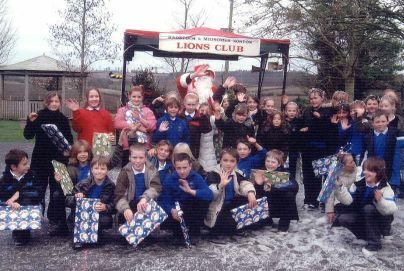 This year we found ourselves providing "Father Christmas" to Radstock Children's centre and Kilmersdon School. This was a "job" that we were delighted to be able to do. We raised a total of £3,900 with our carol float collections. Our grateful thanks to all who donated. 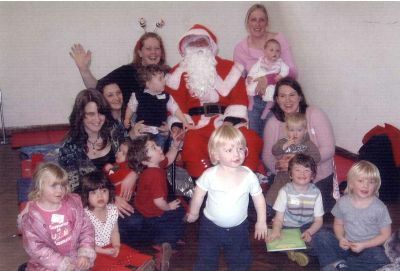 On Christmas Eve, 2007 we were collecting outside of Tesco. At the end of the session, we were approached by Tesco to assist in the disposal of the rather large Christmas Tree, that was decorating their entrance. This we agreed to do and are please to say that we found a good home for it at Fosseway School. 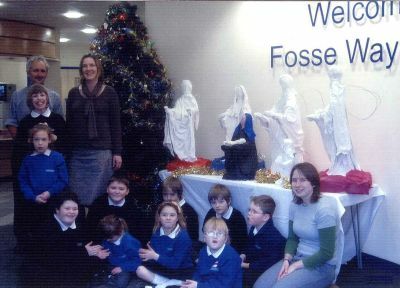 Photo: John, Mairi and Hannah with tree, pupils and the Nativity Scene at Fosseway School. Sunday 7th was our Christmas Concert at the Centurion Hotel where we were treated to perfomances by Norton Hill School Choir and Music Groups, the Mendip Handbell Ringers and soloist, Rebecca Livsey. The collection at this event raised £110 for water re-hydration tablets. The club matches this from our charity funds so we will be donating £220 to this cause. December also sees our annual carol float collection. We will be visiting the local areas starting with Peasdown St John on Monday 8th. District Governor, Lion Surinder Malhotra, made his visit to the club. He thanked the club for their welcome and congratulated them on being progressive and an example to other clubs. He presented the club with CSFII model club banner patch for 2007-2008.
officers and encouraged the continuation of this support. Lion President Alan presented a cheque for £250 (for Moorfield’s Eye Hospital, Ghana) and exchanged friendship bannerettes and thanked the DG for his kind words and encouragement. Photo: Lion President Alan and DG Surinder Malhotra exchanging friendship bannarettes and showing the CSFII banner patch and cheque for Moorfields Eye Hospital. 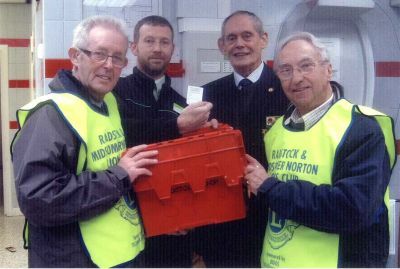 November saw our annual Supermarket draw which was held again at Radco. We had sold all our tickets by 3:00 pm and the draw was made by the store manager. The winner this year was Mr Wall, who receives £250 Radco vouchers. Three runner ups received vouchers for £50, £25 and £10. Photo: Lion Robert, Store Manager, Lion President Alan and Lion Russell. We were treated to a wonderful evening of song by the Maesteg Male Voice Choir, supported by baritone, Lion Byron Hughes and soprano, Sally Kingsbury. Vice President, Lion Derek Livsey thanked the choir and soloists, the audience, St John Ambulance, organist Russell Ford, our sponsors, and the ladies of the Church for providing the refreshments. He ended with a "commercial" promoting message in a bottle (MIAB) and at the end of the concert, we were able to dispense nearly 20 of these life saving devices. 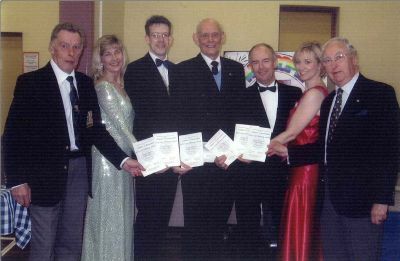 Photo, Left to right: MC Bryn Roberts, Accompanist, Catherine Morgan, MD Huw Morgan, Vice President, Lion Derek Livsey, soprano Sally Kingsbury, Baritone Lion Byron Hughes, organist, Lion Russell Ford. The Sherborne Town Band gave a performance of music and entertainment, somewhat different to what we normally expect. Despite wet and windy weather, the brave audience enjoyed the evening. Amongst the soloists was Sue Hunt, a local girl from Radstock. Lion President Alan was master of ceremonies and we forgave him his musical gaffs! He thanked the band, the audience, St John Ambulance, organist Lion Russell Ford, our sponsors, and the ladies of the Church for providing the refreshments. 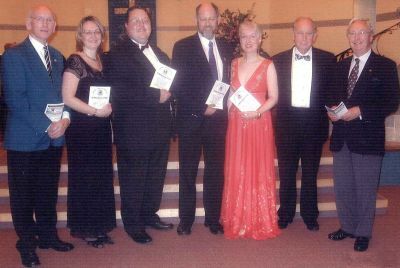 Photo, Left to right: Lion Barry Rogers, Lion President Alan Denham, Musical Director, Stephen Rogers, Sue Hunt and organist, Lion Russell Ford. The museum has hosted a number of exhibitions during its years of operation and Tuesday 9th September, saw the opening of an art and craft exhibition by OBA (The Old Bakery Artists, housed on the top floor of the museum and well worth a visit. OBA has exhibited at a number of venues in the local area, and will be exhibiting in the Royal United Hospital, Bath, later in the year. We took the opportunity to present a cheque for £250, in thanks for Dennis's talk last Wednesday. 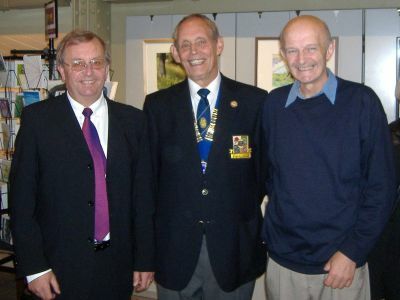 Photo, Left to right: Richard Maggs, Chairman of Radstock Museum Trustees, Lion President Alan Denham, and Museum Manager, Nigel Carter. 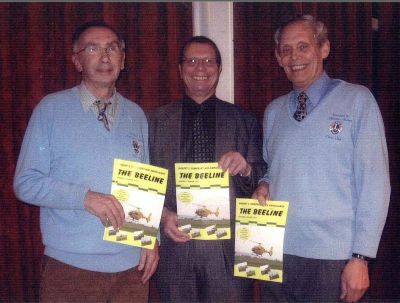 Dennis Chedgy treated us to talk on coal mining in the Radstock area, 1763 to 1975. Mrs Smith from Paulton, supported by Mr Carter, receiving the first prize from Lions Dave and Jack. On Saturday, over 700 ducks to the stream in Midsomer Norton. Sponsored at £1 per duck, this event raised a significant some of money for our charity funds. Our thanks to all who supported us in this event. 22 July - 1 August: Youth Exchange. The zone welcomed 6 young people from around the world. Melissa (France), Isabel (Austria), Mayumi (Japan) stayed with members of this club. Juan with a member of Bath club, and Ruggero and Tobias with a member of Keynsham. On Thursday, Bath club showed them around Bath, including a visit to the Pump rooms. On Friday, we took them to Cheddar and Wells. Monday, Keynsham club took them to Bristol including a visit to the SS Gt. Britain and Clifton suspension bridge, finishing with an excellent BBQ at Lion Peter's. Frome club took them to Longleat and they all came back in one piece! They left us on the 1st August, four going on the Youth Camp. Youth Exchange is aimed at promoting understanding among all peoples of the world. Photo: Left to right Juan, Melissa, Mayumi, Isabel, Ruggero and Tobias. 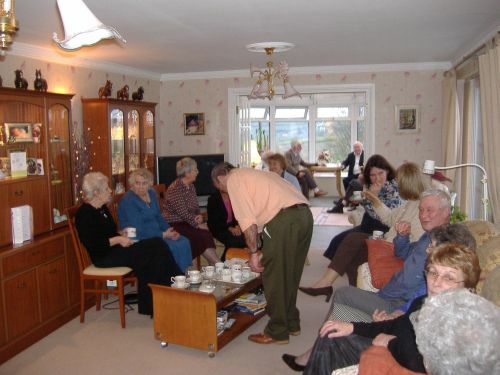 6 July: Senior Citizens Garden Party. 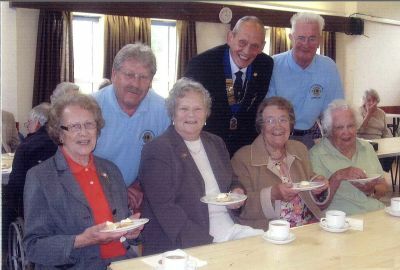 The club welcomed over 80 senior citizens to an afternoon of music, tea and scones. Due to the inclement weather the event was held in the Somer Centre instead of the gardens of Chris and Sheila Jones. 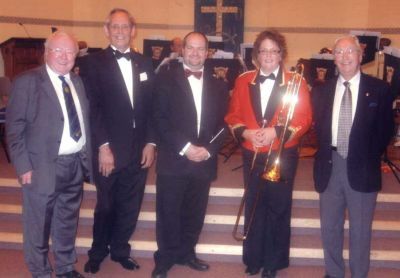 Starting at 2:00pm, music was provided by the Midsomer Norton and Radstock Silver Band, led by Musical Directory, Stuart Lewins. 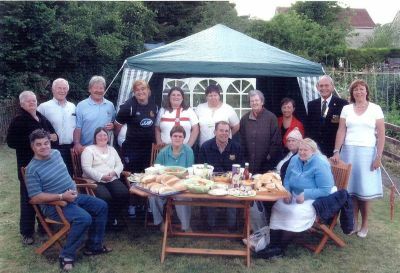 Lion President Alan thanked the organiser, Lion Terry, Lions Ladies for the tea and scones, and St John Ambulance for their attendance. 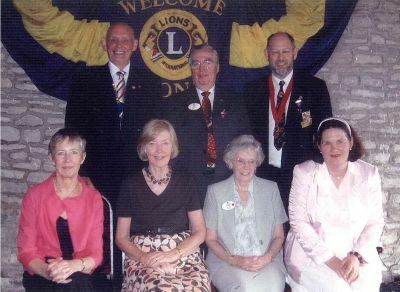 Photo: Paultonians, Joy Headlong, Lillian Marrott, Margaret Milson amd Dorothy Ide served by Lions Terry, President Alan and Jack. The club presented garden furniture to SWALLOW (South Wansdyke, Living and Learning Our Way). 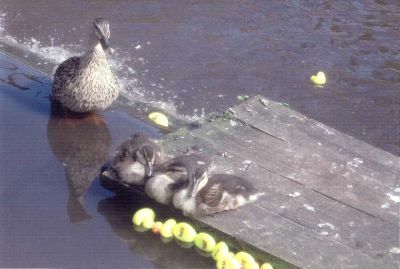 SWALLOW was launched 15 years ago in response to the needs and wishes of local people. Photo: Members and staff of SWALLOW together with Lions Terry and President Alan. Handover this year was held at Cameley Lodge, an excellent meal was provided by the proprietors, Paula and John, in lovely surroundings. 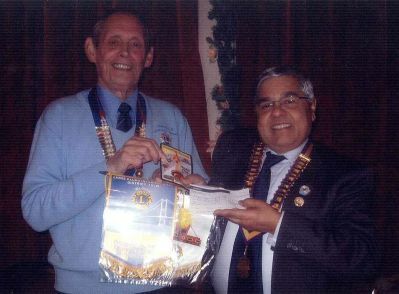 Handover was a bit of non-event, as Lion Alan continued in the post of president for a consecutive year. Lion Alan thanked his team for their support in the coming year and assured the club of his intention to carry on the good work. Photo: Lions Barry and Trevor in the foreground, having just finished their main course. 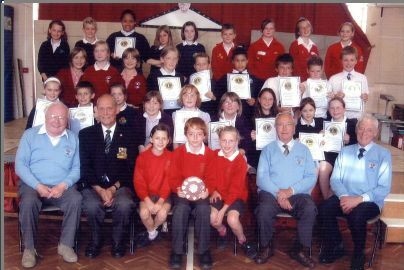 Bath & North East Somerset Junior Schools run an annual public speaking competition. We were pleased to be able to support this by judging the competition and providing prizes. This year 8 schools took part, the competition being hosted by Westfield Primary, (last years winners). Lion President Alan provided a shield which was awarded to the winners, Widcome CofE Junior School. Photo: Competitors together with, on the front row, Lions Barry, President Alan, Russell and Bob. Photo: Lion President Alan (left) and organiser, Lion Geoff Moore (right), flanking some of the competitors. Winners of the golf competition with a score of 48, Ian MacDonald and Michael Taylor, were congratulated by Lion President Alan Denham and Chris James, area manager of Dorset and Somerset Air Ambulance. Over 20 raffle prizes were on offer, the 1st prize, a balloon flight, donated by the Bath Investment Building Society, was won by Mike Calway. Over the last six years, High Littleton British Legion have hosted quiz nights. Tonight was the last of the 2007-2008 season. 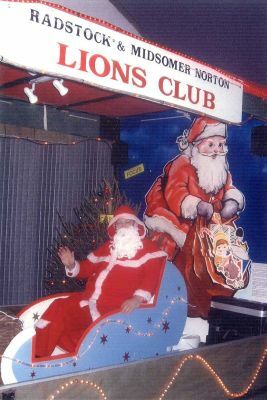 Chairman Harold has organised raffles on some of these nights with the result that this last season has raised nearly £700 for Lions Charity Funds. Our grateful thanks to Harold. The next season will commence on Sunday 7th September. 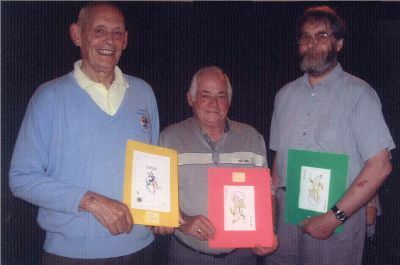 Photo: Lion President Alan, Harold and organiser, Lion Richard Munden, holding "Jokers". 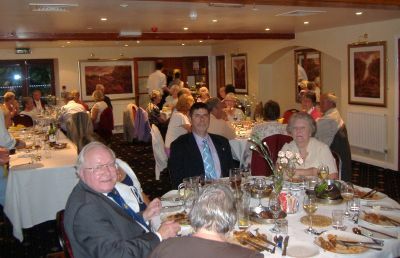 Our 31st charter was celebrated with an excellent Sunday Lunch at Cameley Lodge. We were pleased to welcome District Governor, Lion Ron Clarke as our guest and principle speaker, and his wife Doris and Wendy Walker, from our local newspaper, the Somerset Guardian. Photo: back row: Lion President Alan, District Governor, Lion Ron Clarke, Lion Derek Livsey, club secretary and zone chairman. Front row Wendy Walker, Jean, Doris and Lynne. We enjoy a friendly relationship with Rotary, and we were pleased to welcome Rotary President, and honorary Lion, Peter Kuzemka to our meeting. 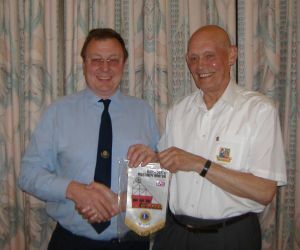 Photo left, Lion Alan presenting club banner to Peter. Photo right, the bronze statue by Derbré, presented to Lion Alan by Chateau Gontier Lions during the recent twinning visit. An excellent visit to Chateau Gontier, France, saw the celebration of 20 years of twinning. For more information click here. 19th April 2008: BLOG Concert. Bath Light Operatic Group (BLOG) comprising 40 artistes, both male and female, entertained a near capcity audience at the High Street Methodist Church, Midsomer Norton. BLOG were led with great authority by Musical Director, Matthew Finch, their pianist, and aided by Master of Ceremonies, David tucker, who described the programme items in detail. The show featured soloist from within the group, duets and full choral items. The curtain came down with 42nd Street, Lullaby of Broadway and an unusual rendering of No Business like Showbusiness. Thanks were given by Lion President Alan, Lion Barry for organising the show, Russell for the organ introduction, St John Ambulance and programme sponsors for their help and contributions. Photo: Members of BLOG together with Lions Dave, President Alan and Russell. 7th April 2008: Skittles v Rotary, 2nd leg. We started the second leg of this match with a 7 point deficit, but by the end of the evening we had changed this to a win. A most enjoyable, closely fought match which could have gone either way. In the end, Rotary lost by a narrow margin and are now the custodian of the stuffed duck. Photo: Rotary President Peter, receiving the duck from Lion President Alan with a supporting cast of Lions and Rotary members in the background. 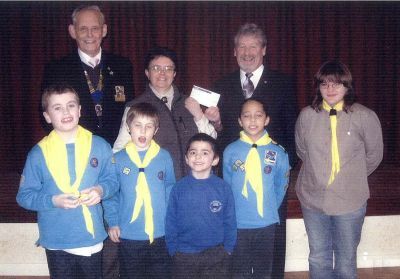 Photo (L-R) Lions Rex, Rob, President Alan, Terry and Jack with Ken Elliot and Kath. Chew Lake Association of Disabled Sailors were given four boat covers costing £750. These will last at least five years. Kath Allsop, Chair of the Association outlined the help from volunteers and sponsors that they had received during the last 15 years since their formation. Kath thanked Lion President Alan and Lion Rob for the donation. Their current venture is a pontoon costing £20,000, to help in the moveability of the boats, and are looking for sponsors. For further information on CLADS, click here or ring Ken Elliot on 01179 612466. We were pleased to welcome Amy Llewellyn, Community Fundraiser for Marie Curie Cancer Care in Somerset. Lion Alan said that he was proud to be a Lion and to have helped with our collecting for this charity for their annual Great Daffodil Appeal. We had collected £926.34 over a two-day period. 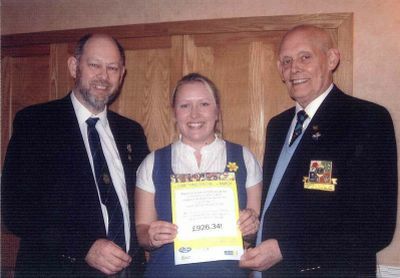 Photo: Amy presenting a certificate to Lion President Alan, and Lion Secretary Derek. World Water Day 2008 was celebrated by the UN on Thursday 20th March. Over a billion people don't have access to safe water and sanitation which is a basic human right. Water Aid's vision is a world when everyone has access to clean water. Without these basics, 5000 children die every day and communities are trapped in poverty and disease. Would you like to be without these basics? 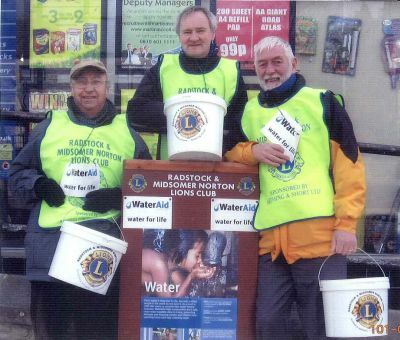 Photo: Lions Russell, Tony and Hilton braving the cold weather on Easter Saturday to collect for Water Aid. Members enjoyed an interesting afternoon with the Progressive Lunch organised by Carol, Lion Richard's wife. Photo: relaxing with coffee in Lion Phil's lounge. An enjoyable and interesting Convention. There is an excellent report on the District Website. click here. Past President, Lion Barry presented a cheque for £1,130 towards the £4.7Million that Forever Friends are raising for the pioneering Holistic Neonatal Intensive Care Unit (NICU) at the Royal United Hospital, Bath. For more info, click here. 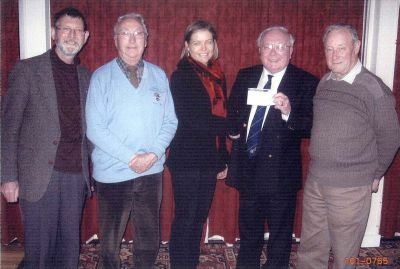 Photo: Community Fundraiser, Rachael O-Connor receiving the cheque from Lion Barry, supported by Lions John, Russell and Ray. Paulton Scouts are raising £60,000 to improve their facilities. They have collected £42,000 so far and the club donated a further £500 towards this appeal. To make further headway, they are looking for a building and design officer. If you can help, Mary Barnes (01761 418200) will be very pleased to hear from you. Photo: Roger Barnes receiving the cheque from Welfare Chairman Lion Terry assisted by Lion President Alan. 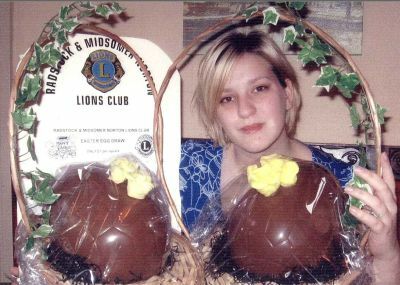 This is the time of the year for Easter Eggs again, and the club has distributed some 50 eggs in the local area. We hope the winners, familes and friends will enjoy the chocolate with the proceeds going to local charities. Photo: Hana, posing with the two eggs at the White Hart, Midsomer Norton. The club was collecting outside Tesco, Midsomer Norton, for Marie Curie, Cancer Care, a worthy cause which we were delighted to be able to help. 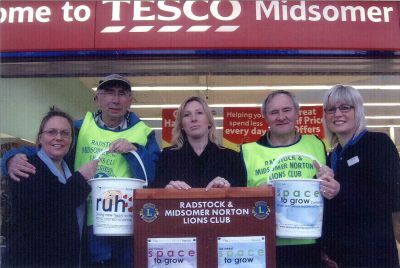 Photo: Lion Rex, Lion President Alan, and immediate Past President Dave, together with Tesco Staff, collecting outside the store on Saturday 1st March. Over the last couple of years, the Scouts, Guides, Cubs and Beavers of this Group have expanded considerably and are proud owners of a site in Radstock. 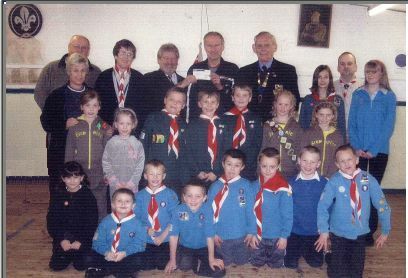 Scout Group Chairman, Roger Lewis said " we see it as a duty to card to use it to benefit the youth of Radstock". He thanked the Lions for their generous donation of £500 towards essential maintenance work. If you are interested in finding out more about Scouting and Guiding, contact John Mander (412007) or Janet Turner, the Wansdyke District Commissioner (417374). 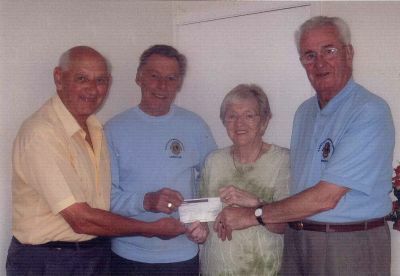 Photo: Lion President, Alan Denham, Janet Tanner (accepting the cheque), Welfare Chairman, Lion Terry Porter, and Scout Leader, Kim Turner. Chris James, area manager, gave us a most interesting illustrated presentation on the Air Ambulance. It costs £3,500 per day, a staggering £1.2 million a year to run. It is run by a registered charity which receives no funding from either the NHS or National Lottery, and is totally dependent upon public support. The helicopter is very versatile and in addition to the pilot and two paramedics can transport a stretchered patient and also a companion. It is packed with life saving equipment and travelling at up to 180 mph can quickly reach any part of the two counties. Patients can be delivered directly to hospitals and specialist units in the area. Chris James on 07768 778169 or 01823 351114. Royal United Hospital Bath need space to grow for the Neonatal Intensive Care Unit. Each year, this unit provides 24 hour care to around 500 premature or desperately ill newborn infants in cramped an noisy surroundings. The RUH has no alternative development funding and needs help now, not in ten or fifteen years. Thank you for your help in supporting this worthy cause. 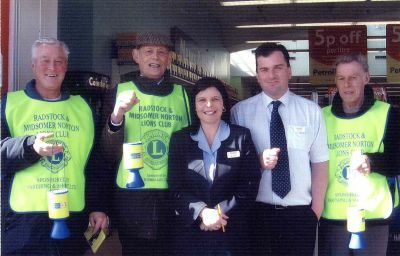 Photo Lions Geoff and Tony with Tesco staff.